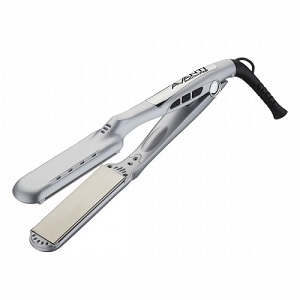 The Babyliss Avanti Titanium flat iron is 1 3/8 inches in width and comes with nano-technology and wet to dry plates. Nano-technology plates involve the compression of molecules, resulting in greater stability and increased benefits from the properties of the titanium. Titanium plates offer a smooth glide and won't snug, pull or stick to hair. The advanced ceramic heater (MCH) provides quick heat up, stable temperatures, and is lightweight and long-lasting.